Chief Superint. Bill Tillbrook of the CO19 firearms unit, not seen here. Press Gazette has the full story here And quite frankly it’s a shocking tale. 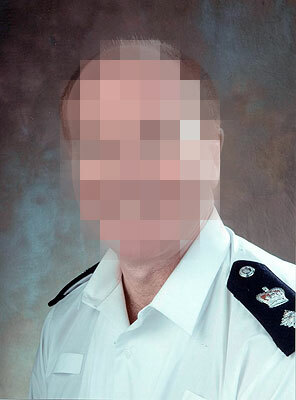 Apparently an agreement was made where picture desks would be issued guidelines from the Met Police to blur or pixellate the faces of armed officers. The current guidelines that were drawn up by the NUJ and BPPA took two years negotiation with the Met police and since early 2007 were adopted nationally by ACPO. So for Nigel Howard to go a meeting that no professional photographers body was represented at and make a unilateral agreement that photo desks and editors should pixellate the faces of armed officers is a serious affront to press freedom. The press need to be able to hold the police to account, especially armed officers. The stories of Scott Hornby and Alan Lodge seem pertinent here. Officers should be identifiable and accountable to the public. There are already clear guidelines detailing how relations between the press and the police should be conducted. Those guidelines have been agreed between ACPO, the NUJ and other news organisations. We would have serious concerns if they were to be undermined by unilateral action by a specific branch of the police force. It is unacceptable for the police to discuss, informally, with a group of independent photographers, matters such as this and them to then be reported as some form of agreement. Hopefully that will put a nail in this agreement and ward off future attempts by the police or rogue photographers trying to cut backroom deals. Jonathan, FYI please see the attached which was published in the press gazette. As the organiser of the meeting that took place between photographers and police It is important to set the record straight and address the concerns of phtographers who did not attend the meeting and also offer some background as to how and why the meeting was structured. I sent an email to National newspaper picture desks and also to to the PA, NUJ, BPPA in addition to news agencies. Several follow up phone calls were made to see if and who they would be sending. Additionally I also invited many other freelance photographers by telephone and explained the reason why the meeting was organised (as they had were not in receipt of the email invitation), I also mentioned to some that they were most welcome to also invite others that they thought would benefit from attending the meeting. This meeting as far as I am aware is the first meeting of it’s kind to have taken place between photographers and the Metropolitan Police Firearms unit CO19 and came about after (an incident in Kensington involving armed police) a series of phone calls, emails and indeed a previous meeting some months with Commander Jo Kaye. I cannot speak on behalf of others that attended the meeting, I found it to be informative and rewarding, myy thanks to police for agreeing to the meeting. For those who are aware and indeed for those who are not aware the original talks with police started some years ago with a number of respected photographers, namely Jeff Moore, Paul Stewart, myself and also the NUJ. Jeff Moore, Paul Stewart and the NUJ continue to have talks with the police, I also have talks with police fully independently of the aforementioned persons and bodies which have proved to be constructive and rewarding and have seen some quite amazing results. As a member of the BPPA and NUJ I am fully supportive in their ongoing talks and indeed wish them every success. It is with great regret that more photographers did not attend the meeting and question police, voice their opinion in an open forum and enter into discussion with them and their fellow photographers. Perhaps if they did they would have been better informed to have known exactly what had taken place. It was not my intention and has not been at any time my intent to speak on behalf or indeed represent any body or organisation or any other photographer, save for the fact that I informed my newspaper that I work for as a freelance photographer that I organised the meeting and would be attending. In closing let it be made perfectly crystal clear, that no deal or agreement was made at the meeting to pixilate the faces of armed police officers by photographers. It was made clear and understood by police that this is a decision to be taken by Picture Editors and NOT photographers. The Met have are however considering writing to picture desks asking that CO19 officers faces are pixilated, again this is a decision for Picture Editors and NOT photogarphers. I sincerely hope that this now addresses any outstanding issues any photographers have or had as a result of the meeting.